A visit to our therapy center is the ideal start for GIGER MD® Parkinson’s therapy. Make an appointment for a free trial therapy session! Begin your efficient Parkinson treatment in our therapy center in Solothurn in Switzerland. There, we offer patients a personal and complimentary Introduction to GIGER MD® therapy, including a first therapy session. 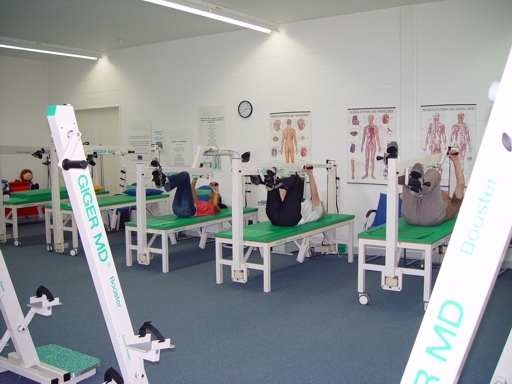 As the developer, manufacturer and distributor of GIGER MD® therapeutic tools, we have over 30 years of experience with this efficient learning and exercise therapy. Take advantage of this experience and the new opportunities that it provides to Parkinson’s patients. The patient learns how to use the GIGER MD® therapy instruments within just a few days when visiting our therapy center. He then independently executes the therapy on a daily basis at home. The training is recorded via a PC, evaluated and continuously adjusted to the training progress and personal needs. The success of the therapy can be electronically compared with that of other patients. On this basis, the training will be further improved. A short training period under professional supervision in our modern, well-equipped treatment center. Thereafter, the patient is about to autonomously carry out the training at home. Therein, the patient benefits from ongoing adaptation and improvement of the individual training program. Via the special GIGER MD® software, the patient receives regular updates on the training progress. You want to learn more about our offer? Then visit us for a free trial therapy session at our treatment center. Of course, we are happy to answer all of your additional questions on GIGER MD® Parkinson’s therapy, the treatment process and your chances of success. All of this is offered completely free of charge and free from any further obligations. Contact us here for further information or sign up for a trial therapy session!